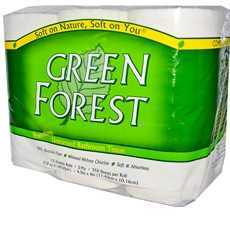 Enjoy Green Forest Unscented Bathroom Tissue . Green Forest Products Are Soft, Strong And Absorbent, And Are Soft On The Environment As Well! Many "Environmentally Friendly" Household Paper Products Do A Good Job For The Earth, But They Feel Stiff And Scratchy. We Have Discovered State-Of-The-Art Paper That Meets Very Advanced Environmental Standards, But The Paper Is Also Bright And Extremely Soft. Try Green Forest Paper Products For Yourself! (Note: Description is informational only. Please refer to ingredients label on product prior to use and address any health questions to your Health Professional prior to use.